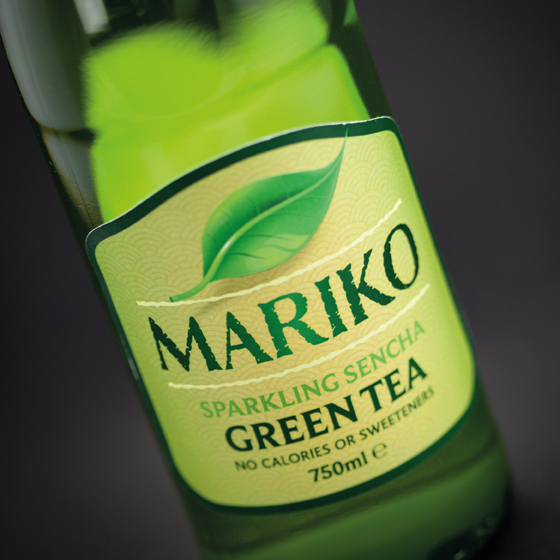 Mariko Sparking Green Tea is an innovative new drink developed by Mayo entrepreneur Christine McAndrew in conjunction with food technologists at The College of Agriculture, Food and Rural Enterprise (CAFRE). 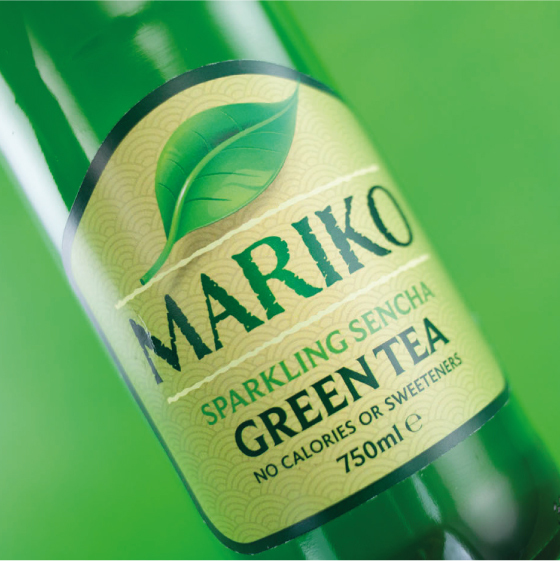 Inspired by recent studies into the health benefits of green tea, Mariko is a delicate, golden sparkling green tea drink that is lightly effervescent, thoroughly refreshing and naturally sugar free. Although there are several green tea based drinks on the market, Mariko is unique in that it combines centuries of tea tradition with a state of the art brewing technique. Brewing in this way results in Mariko being exceptionally rich in the naturally occurring EGCG, a powerhouse antioxidant believed to have myriad health benefits. With larger food and drinks producers a full launch suite would be developed including POS materials, selling aids, advertising. With independent producers however, launch budgets are more modest requiring a different strategy. 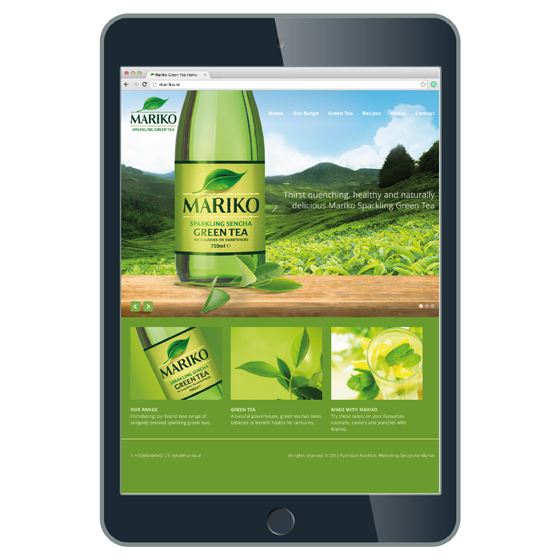 Therefore we concentrated on developing a website that showcased the Mariko range, conveyed the brand’s core values of health, refreshment and sociability, while establishing a broad range of usage occasions for the product. 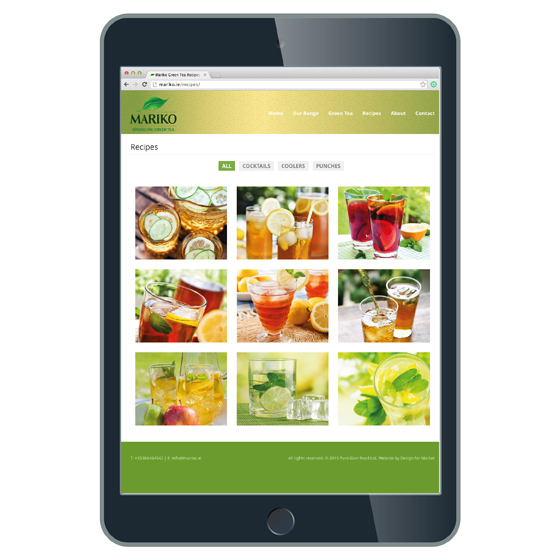 Our newly launched Mariko.ie features a comprehensive recipe listing, broadening its appeal beyond simply being a non alcoholic alternative, to being a versatile and healthy ingredient for punches, cocktails and coolers.